This was challenging for me to paint for several reasons. The sun being out is one of the biggest challenges for me! I am so used to painting under gray skies. When the weather is nice, the waves get very small. Today they were only about a half foot high. The sea calms and the waves are fewer. I also have to deal with the sun on my palette and painting. The umbrella doesn't work in windy conditions and the sun usually brings on the wind. On the plus side, I get get to paint a lot more blues! I had considered packing up and just painting in the studio but it felt so good to be out in the sun. I was even able to take off my jackets (yes plural, it gets cold on the beach in the wind and wet!). I am glad I stayed as this challenging situation was good for me. I can't say I am entirely happy with the painting but that is why I go out to practice and paint these wave studies, I want to get better. 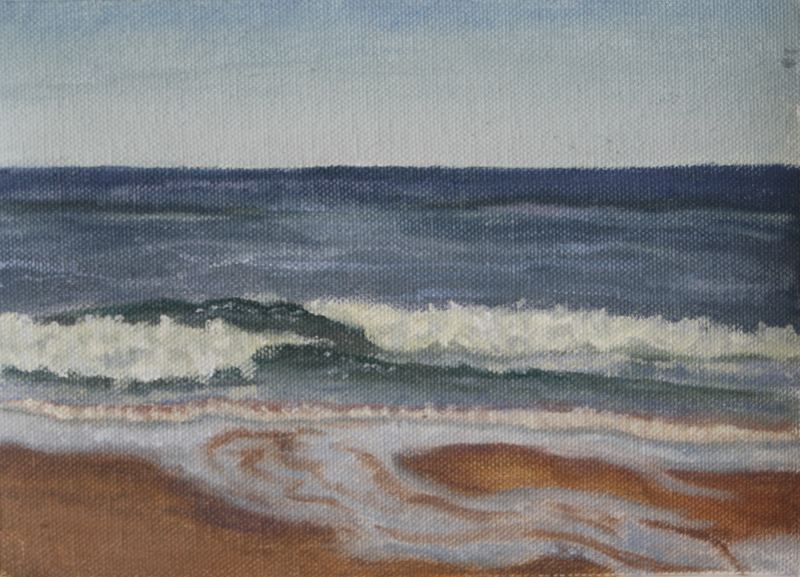 If all goes well, I will be heading out again tomorrow to paint....wave study #50! I will be at the half way mark for this first 100. I am also excited as I have a lot of packages headed my way that contain a new plein air system, new brushes, copper panels, and a new ramp for Twill so she can come with me on future painting excursions! As the weather improves the waves will be a lot like what I saw today. The painting conditions aren't my favorite as I like the seas on the wild side. That means I will be popping to the local state parks, both north and south, to do some landscapes as well as seascapes and with the ramp, Twill will be able to come with me too. This summer, I will be putting some of the paintings up for sale and posting them on the Paint the Parks site. Ten percent of the proceeds will be going to the Oregon State Parks Foundation. It has been a busy day and tomorrow will be too. I am off to clean up my gear and practice my cello. Well I would think half the fun of plein air painting is where you do it and who doesn't love a sunny day on the coast? And those days are always elevated when we can take our best friend with us. Hope your ramp comes soon. Lucky Twill. Pets all around!